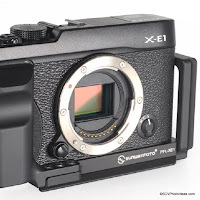 Sunwayfoto® has just announced the release of a new Custom L Bracket for the top line Fujifilm X-H1 mirror-less interchangeable lens camera. The plate follows an one piece design, which makes it more rigid and less prone to vibrations when sitting on the side vertical plate. Furthermore, it follows the latest changes in Sunwayfoto finishing, which means a robust satin hard-coat anodizing as well as full compatibility with any Arca-Swiss® style dovetail and with RRS® Lever Release clamps. On the other hand the price tag is quite mediocre, for such quality products coming from Sunwayfoto. 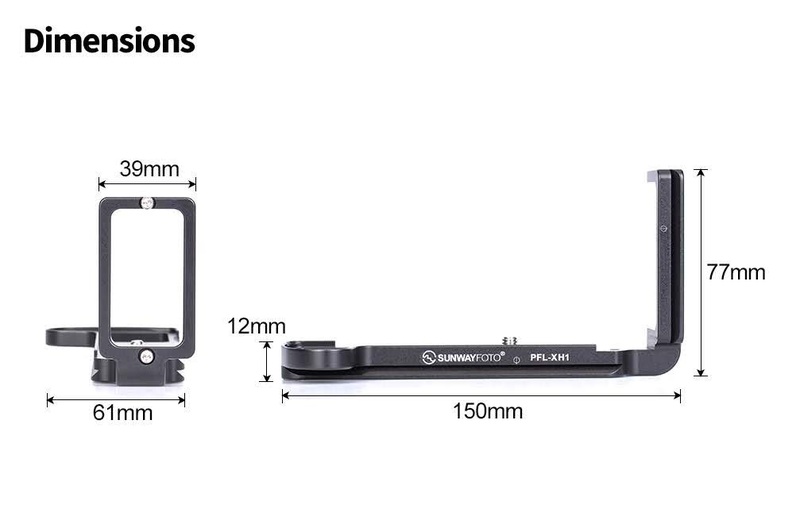 The Sunwayfoto PFL-XH1 L Bracket has a full length plate designed to cover the base of the camera. Also a full length ridge at the front, curves around the camera front grip and ends at the back. 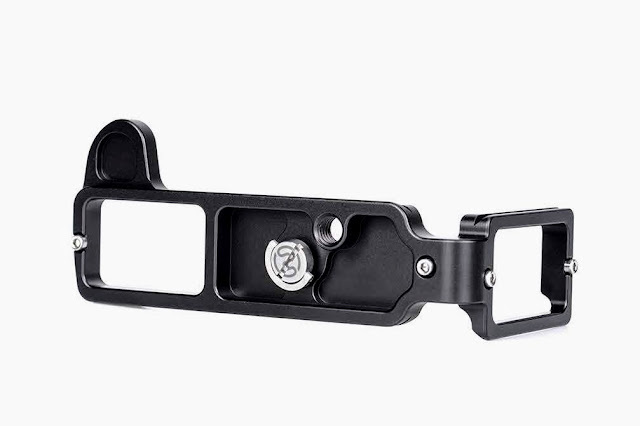 The ridge undertakes the role of immobilizing the L plate on the camera in all directions. The rear side of the base plate lacks a ridge, while it is filed so much as to allow for unobtrusive movement of the camera tilting screen. The vertical plate is also filed on the rear side allowing for better grip and opening of the left side plastic covers of the connectors. The hollowed out design of the bottom of the plate has a large opening for easy battery and memory door access. 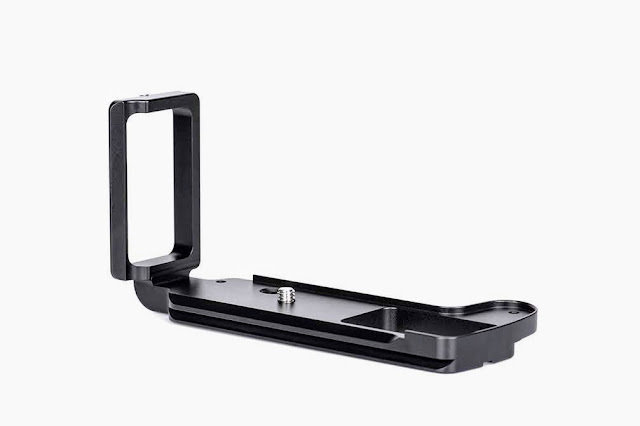 Besides the camera mounting 1/4"-20 D-Ring captive screw which has recently become a standard with Sunwayfoto Brackets and plates, conveniently sports also a slot for a coin or large flat screwdriver. 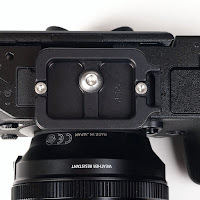 Something unique I may say, as I see it for the first time on an L Bracket or camera plate is the existence of one 3/8"-16 threaded hole (instead of a 1/4"-20) beside the mounting screw; facilitating the direct mounting on a pod or other device with a 3/8"-16 stud. A total of four M3 safety stop screws are placed one at the end of each side on the base and vertical plates not allowing the plate to drop off a semi locked clamp. I should mention that the base plate and the vertical plate dovetails are not completely aligned. The existence of a little offset backwards of the vertical plate requires a change in camera framing and/or focusing when changing orientation from landscape to portrait and vise versa. 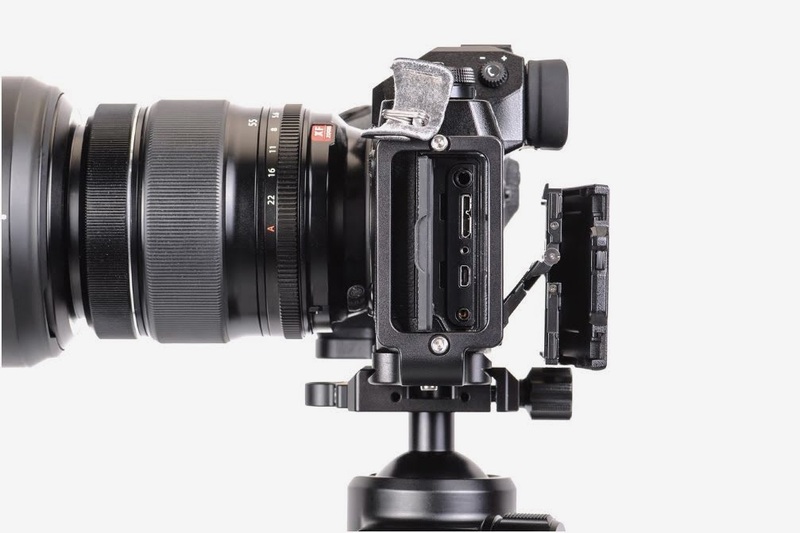 The vertical plate design, together with the forementioned off-set, has all appropriate cut-outs in order to allow full access to the left-side camera connectors and strap loop. Illustration of the Sunwayfoto PFL-XH1 mounted on the camera showing side connector and tilting screen freedom. 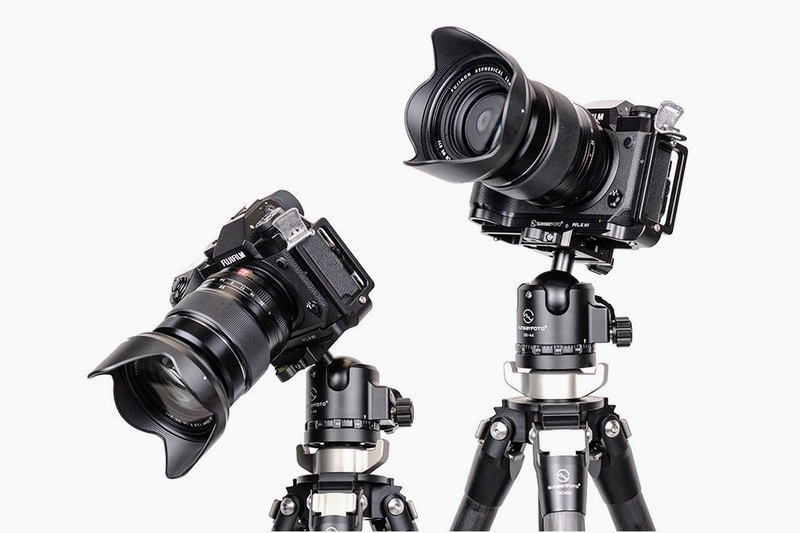 Fujifilm X-H1 equipped with Sunwayfoto PFL-XH1 mounted on XB-44 ball head and T2C40C CF tripod. Same as with all Sunwayfoto products, all necessary stainless steel screws and tools are included in the package. The L bracket is accompanied by 4 x M3 safety stop screws and the appropriate size Allen hex wrench, 1 x 1/4"-20 D-Ring mounting captive-screw and a velvet protective drawstring bag. Sunwayfoto PFL-XH1 L bracket with screws and drawstring bag.